Easter’s almost here! Start planning your Easter weekend now - there are plenty of fun family activities going on in Tampa Bay. 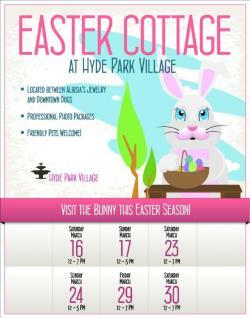 Visit with the Easter Bunny in Hyde Park Village! The bunny will be available and offering professional photo packages on March 16, 17, 23, 24, 29, and 30. The Easter Bunny’s hours are available here. Maestro&apos;s Restaurant at the Straz Center will have Easter brunch with the Easter Bunny on Sunday, March 31. Seatings are at 11 a.m. and 1:30 p.m. To make a reservation, call 813-229-STAR (7827). Florida’s oldest restaurant, the family-owned Columbia Restaurant in Ybor City, will be open on Easter and serving holiday favorites such as roast leg of lamb “Dali” and baked Virginia ham, finished off with chocolate tres leches (sponge cake in a mixture of three milks and chocolate) and fresas con bizcocho de almendras (fresh strawberries with sherry on homemade almond cake) for dessert. They will also have sangria available made with champagne and citrus juices. The Columbia Café on the Riverwalk and at Tampa International Airport will also be open on Easter, though not serving an Easter menu. At the Westin Tampa Bay hotel, Aqua’s waterfront dining will be serving over 25 chef-inspired menu items, such as brioche French toast, made-to-order omelets, and herb roasted beef, along with mimosas and bloody mary’s. The brunch is $49.95 for adults and $15.95 for children 10 and under. To make a reservation, call 813-675-8700 or visit AquaTampa.com.